March 23, 2018: The Solar Week @ AO - Special Events started last Wednesday 21st at the Science & Visitor Center (SVC) - Angel Ramos Foundation with a series of lectures offered by local scientists and guest speakers. The SVC has joined this bi-annual celebration to encourage elementary and junior students to explore the wonders of our nearest star. Also, one of the main focus for this type of events is to motivate young students to pursue higher education careers in Science, Technology, Engineering, Art, and Math (STEAM). Visitors had the chance to learn, firsthand from our speakers, what type of work scientists do at AO and how their efforts contribute to the study of the Sun and its fascinating scientific ramifications and applications. Our star, the Sun, is by far the most important source of energy for life on Earth. It is our key reference for time, which define our seasons, harvests and its effect has even implications on our sleep patterns. This star, nearly perfect sphere of hot plasma, having a diameter of approximately 1.39 million kilometers, does possess one outstanding quality which may make it unique in the Universe: it is orbited by a planet teeming with life. There is a complete spectrum of scientists that shared the interest and enthusiasm for this topic including physicists, chemists, astrophysicists, biologists, paleontologists, botanists, archaeologists, psychologists, oncologists and many others. The Science & Atmospheric Science (SAS) department at the Arecibo Observatory is a quite diverse scientific group containing mechanical/industrial/electrical engineers and physicists. This group of scientists dedicates most of their time doing research to measure upper atmosphere composition, temperature, and densities in order to understand the controlling physical processes. The Arecibo Radio Telescope can measure the growth and decay of disturbances in the changing layers of charged particles which populate the region known as the ionosphere (altitudes above 30 miles). The "big dish" is also used to study plasma physics processes in the electrically charged regions of the earth's atmosphere. where radio waves are influenced most. 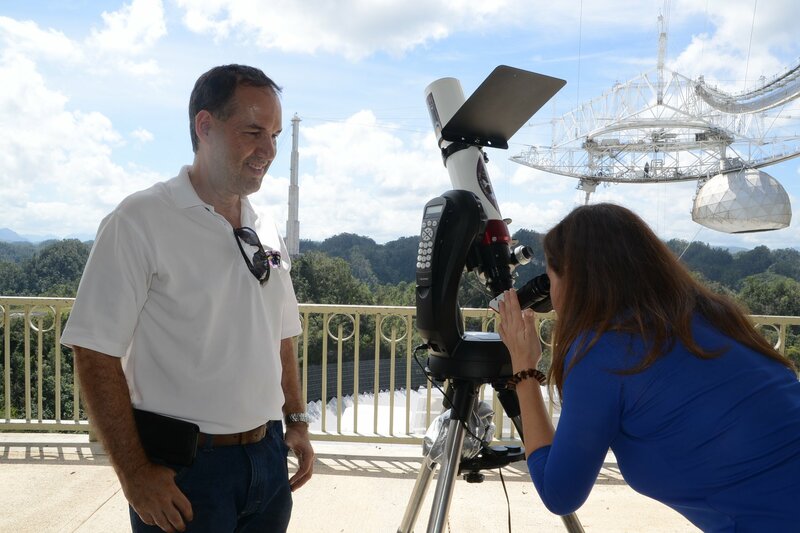 Space physicist Dr. Alessandra Abe Pacini, member of the SAS team, was kind enough to share her experience and explained more about the importance of the Solar events in the upper atmosphere that are studied at the Arecibo Observatory. She was the speaker for Thursday's lecture. "When we enjoy one of the mesmerizing Puerto Rican sunsets, we don't imagine how dynamic and amazing is that little yellow ball of gas. Our Sun is our closest star and also our most amazing plasma physics laboratory. Everything related to the solar magnetic activity is fascinating! The way the active regions are created in the solar surface, how they develop, how they release the energy in beautiful and powerful solar flares... The way the solar magnetic field (also known as Interplanetary Magnetic Field - IMF) changes along the solar cycle and modulate the transport of energetic particles (including the cosmic rays) inside the Heliosphere... The way the Earth's atmosphere (from the bottom to the top) responds to the solar variability... All the features of the solar activity are interesting, intriguing and wonderful!" Also, the head of the SAS team, Dr. Christiano G. M. Brum, shared his notes about the effects of the Sun and on Earth from the atmospheric studies perspective. "The Sun and its interaction with the interplanetary medium rules the behavior of the Earth’s upper atmosphere. The eleven years solar cycle can be seen in different thermospheric parameters recorded by the Arecibo Observatory radar and its probe nest. Variations on the meridional neutral wind component, ion-neutral-electron temperatures and changes in the electron density suffer dramatic variation along the solar cycle. Transient events like coronal mass ejection and solar flares can trigger geomagnetic storm which may disturb the radio transmission all around the world. Solar induced disturbances can impact the Caribbean region by generating errors in GPS measurements which impacts the mercantile navigation between the Pacific and Atlantic Oceans and the accurate geopositioning of offshore oil and gas exploration platforms along the Gulf of Mexico coast." For Wednesday's lecture, we had the participation of Mr. Eddie Irizarry who is the VP of "Sociedad de Astronomia del Caribe". He brought his Solar telescope where students and teachers had the opportunity to have a safe and close look to the sun. Today, Friday 23rd, we had the participation of Dr. Jonathan Friedman, who is a senior scientist, also part of the Science & Atmospheric Science team. "The sun impacts the atmosphere from top to bottom. Short wavelengths are absorbed in the near-space environment. Longer wavelengths at lower altitudes, until you get to the stratosphere, where ozone absorbs ultraviolet. These absorptions drive physics from forming space plasma in the ionosphere to winds which create waves that propagate upwards, depositing energy in the upper atmosphere. These pinch at the edge of space, generally considered to be at an altitude of about 100 km (60 miles), where the atmosphere transitions from a turbulent atmosphere, like near the ground, to a laminar atmosphere, such as in space. At that boundary, serendipitously, meteors burn up, leaving behind a layer of metal atoms. We excite those metal atom layers with lasers, essentially creating artificial stars, which are good tracers for the dynamics, climate and chemistry of the edge of space. Our current research looks at this region, looking at long-term temperature trends and local sporadic activity such as waves, narrow layering events, and atom layers at much higher altitudes, where they were unexpected and unobserved until very recently." In addition to our local scientists and guest speakers, there is a group of people that made all possible for the Celebration of this week's special events. The extraordinary SVC staff, including Mrs. Yasmin Santiago (Supervisor), who planned and coordinated the activities, Mrs. Wanda Menendez (Administrative Assistant), Sujeily Santiago (Administrative Director), Mr. Andrew M. Ortiz (Executive Director of the SVC & Co-PI of the Arecibo Observatory), Ricardo Correa (Communications Officer), and last but not least the support staff including our dedicated tour guides. The tour guides from the SVC are doing a great job encouraging our visitors to keep developing their curiosity, as it is a key element for learning in general and for the continuous development of science. They illustrate visitors to keep studying the world around them, and speciallly throught this week, our principal neighbor and our closest star, the Sun.